Here is number 4 of the ultimate fanboy mag, Nintendo Power. 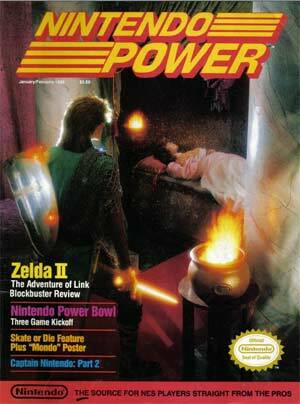 This time around, we are welcomed by a cover story of Zelda II: The Adventure of Link. The cover photo has to be on of the oldest-looking representations of Link I have seen. The article iself stars on page 18 and continues for about 15 pages. Once we journey further into the magazine itself, we also find some interesting features on games such as Wrestlemania, Skate or Die (including a rad late 80’s style poster), Marble Madness, and Metal Gear.